“EBCO” Engineering & Building Co. was established in 1975, few months before the start of the Lebanese Civil War. The company challenged the threats and overcame the risks backed up by a loyal and motivated staff willing to fight for survival. As hard and dangerous as it was, it made it through and is now ranked among the largest contracting firms in Lebanon. In 2005, Eng. Jalal Bitar, main founder and owner, has decided to embark with a new and improved version of EBCO naming it EBCO (BITAR). With his vision to expand, the firm is today executing big construction projects, and has offices and teams spread all over Lebanon. EBCO (BITAR) conducts major projects with both public and private sectors. Its portfolio encompasses different types: residential, commercial, educational, health care, athletic, cultural, archeological, electro-mechanical, telecommunication and infrastructure. EBCO (BITAR)’s in depth experience and engineering expertise in such a variety of projects highlights its ability to execute any given project. Other services provided include preconstruction services, design, project management and engineering consultancy. 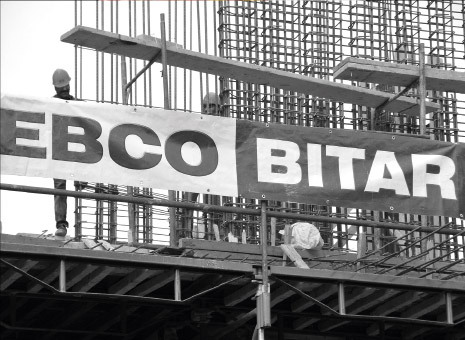 EBCO (BITAR) is now stepping beyond construction works to offer such complimentary services to its clients. Its commitment to quality, time and budget confirms its credibility and reputation in the Lebanese market. The team works hard to maintain the highest level of professionalism and efficiency and believes in the need to grant the best services.